Next weekend there'll be Prague Food Festival at Museum Kampa. So if you're in Prague and love great food you can't miss this festival. Entry fee for Prague Food Festival is 350 Kc (that's about 13 Euro or 17 US dollars) and you can taste the best of the best 12 Prague and Czech restaurants every one of the three festival days. You'll get all the details about Prague Food Festival 2007 at the PragueFoodFestival.com. There is also an exhibition Andy Warhol - Disaster relics: Selected prints at Museum Kampa. Very good and definitely worth seeing as my friend told me last week. 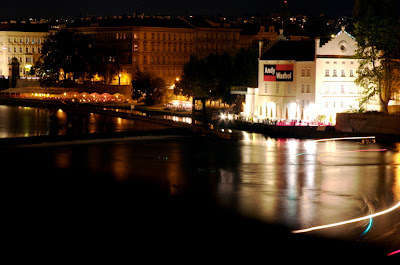 And by the Andy Warhol poster on the picture you can see which building Museum Kampa is (as seen from Charles Bridge).